This post contains sponsored content. All opinions are my own! The kids are back in school and that means mom finally gets to WORK! I love my children, but my productivity slows down to “necessity only” during the summertime and I really feel like I pay for it in the fall. TOTALLY worth it though. Totally. We had such a fun summer. While the kids are at school, I try to pack all of my deadlines, errands, chores and writing into that precious uninterrupted time period. This way, when they step off that bus in the afternoon, I can focus on them completely! Due to this one track mind attitude, I have to admit, I don’t treat myself very well. I often skip breakfast or lunch, or just mindlessly snack throughout the whole day. If it requires more than 5 minutes, meal time is not happening around here (until dinner and after dinner, during which I eat a good 80-90,000 calories). I used to eat leftovers for lunch, but we don’t really have leftovers much anymore! As a rule, I shun most frozen meals. 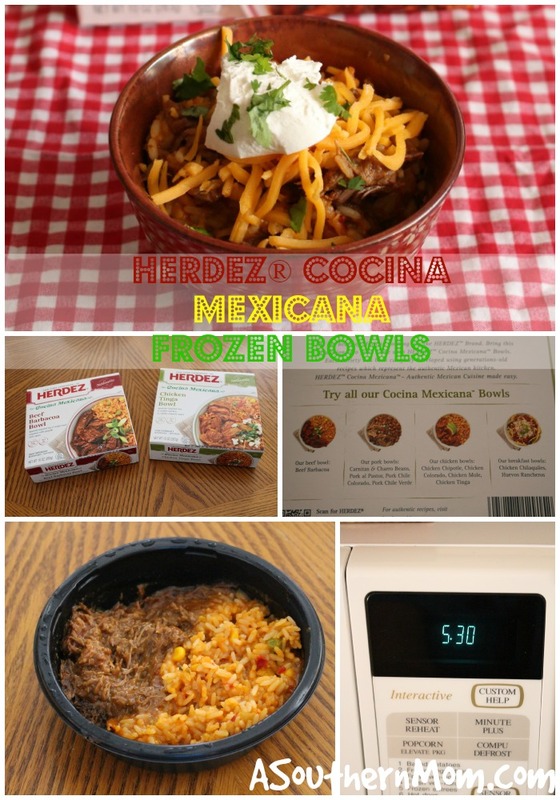 However, I LOVE Mexican food, so when I heard about these HERDEZ® Cocina Mexicana Frozen Bowls, I knew I wanted to give them a shot! 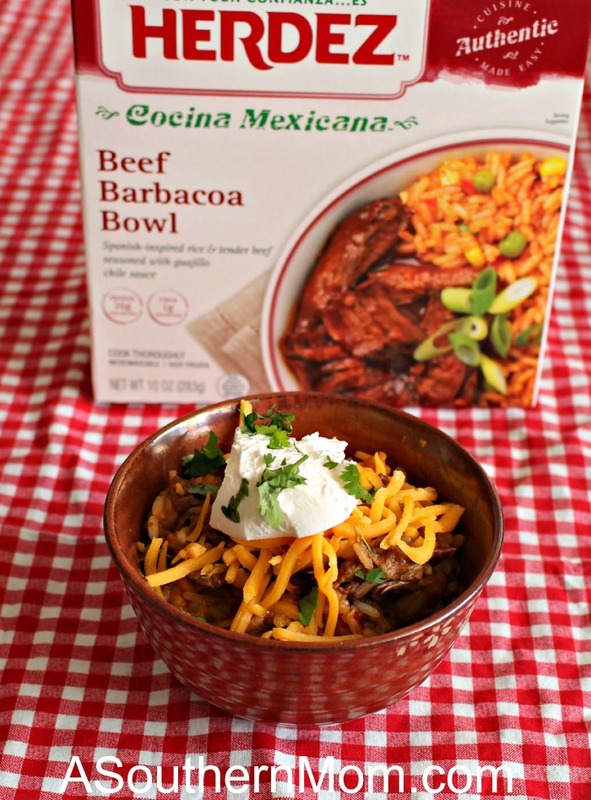 HERDEZ® Cocina Mexicana Frozen Bowls come in 10 delicious flavors. The top 3 favorites are Beef Barbacoa, Carnitas w/ Charro Beans & Pork Chile Verde. I bought a few different varieties (I found mine at Kroger) and decided to (of course) try the Beef Barbacoa first! These take 5 minutes and 30 seconds to heat up. So while my lunch was heating, I emptied AND filled the dishwasher (isn’t it amazing how we think that task takes so much longer than it truly does?). I added a little dollop of sour cream and some cheese once my Herdez Frozen Bowl was finished heating and was back at my desk within 6 minutes! It was AMAZING. So yummy! Quick, easy and filling. If you are interested in giving HERDEZ® Cocina Mexicana Frozen Bowl be sure to print out this $1 off coupon. You’ll find these in your grocer’s freezer aisle! I don’t know who wrote this “review” but it sounds suspiciously like a company employee. I tried the Chicken chipotle bowl today, and paid $3.50 for what was essentially a bowl of white rice and sauce. Where’s the chicken?? The box photo, which is done by a food stylist, makes it appear the contents are 1/2 meat. Not so! Maybe a few shreds. I have always liked the brand, but this is a joke. No more of these for me!